It’s always hard to plan for a fish meal around here, because it all depends on what the market has fresh. You can show up at the store with the best intentions of securing a thick halibut steak only to be disappointed with what clearly looks like it’s been sitting under the glass for a few days. We like to sauté skin-on salmon, because when the skin is crispy fried, there’s nothing better. It’s like salmon bacon. In this recipe we are pan-frying the salmon. If you prefer, you could just as easily bake or poach the salmon, and serve it with the same sauce. We used skin-on salmon for this recipe, but you can use skinless fillets if you want. The skin tastes great when it is fried and crispy (salmon bacon!). When buying skin-on fish, make certain the fish has been scaled. Ask your fishmonger to do this at the store. Make sure you use "heavy" whipping cream for the sauce or it will curdle. 1 Cook the lemon cream sauce: Pour the lemon juice, broth and cream into a small pot and bring to a simmer. Immediately lower the heat to low, cover the pot and simmer gently for 10 minutes. Add salt and pepper to taste. The last minute or two, uncover the pot and increase the heat to high to reduce the sauce a bit. 2 Prep the salmon: While the sauce is cooking, rinse the salmon in cold water and check for any stray scales (if skin-on). Use needle nose pliers to remove any pin bones. Pat the fish dry with paper towels. 3 Cook the salmon fillets: Add the oil to a sauté pan large enough to fit the fillets in one layer. Heat the pan on high and let the pan heat up for 90 seconds. You can either lay the fillets in the pan skin-side down or skin-side up. If you lay the fillets down skin-side down, this will help crisp up the skin which is great to eat (try it, if you haven't, it tastes like salmon bacon!). If you lay the fillets down skin-side up first, the fillets will be easier to turn over without falling apart, because the raw skin helps hold the fillet together. Your choice. Lay the fillets in the hot pan and lower the heat to medium. Let the fillets sizzle steadily for 3-5 minutes, depending on how thick the fish is. A 1-inch-thick fillet will take about 5 minutes. With a metal spatula, gently turn the fillets over. Cook for another 1-5 minutes, depending on how well-done you like your fish. We like our salmon a little rare in the center, so we cook the second side of a 1-inch fillet about 3 minutes. 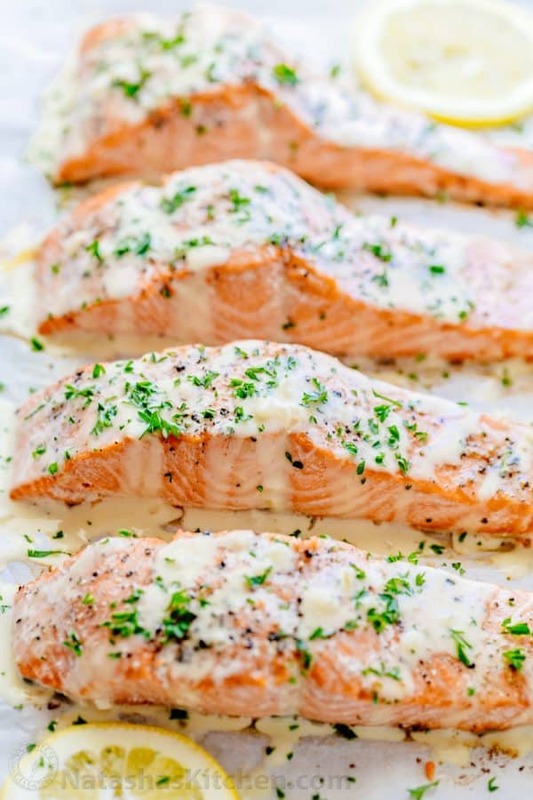 4 Pour lemon cream sauce over the salmon: Place the salmon fillets on plates and pour lemon cream sauce over them and sprinkle with chopped parsley to serve. If you've crisped up the skin, serve the fillets skin-side up so they stay crispy. Otherwise serve the fillets skin-side down. 0 Response to "Salmon with Lemon Cream Sauce"